The biggest of all cats: a tiger at Big Cat Rescue in Tampa. TAMPA — How do you get the attention of a 500-pound lioness? If you work at Big Cat Rescue, you wander over to her oval encampment with a hunk of red meat dangling from the end of a long pole. Almost instantaneously, Nikita will appear and down that juicy morsel in one bite. She’s an exquisite creature with a long body, a full coat of tan fur, and inquisitive eyes. Little would you know that she spent her first year on a concrete slab, chained to a wall by a Tennessee-based drug dealer. “She was confiscated in a drug bust and arrived here declawed and with sores on her elbows the size of tennis balls,” says Jeff Kremer, one of eight full-time employees. This is the type of story you hear at Big Cat Rescue, the country’s largest wildcat refuge. The nonprofit sanctuary was founded in 1993 by Carole Baskin, a local real estate agent who bought a 40-acre (now 55-acre) property that had been in foreclosure. She had just purchased 56 bobcats from a Minnesota furrier and needed a haven where they would not be threatened with slaughter for their fur. Today, the sanctuary is home to 115 wildcats; most were abused, abandoned, or retired from circus acts, the result of an exotic animal trade in the United States that has gone unchecked. “It’s a $2 billion dollar industry with very few regulations,” says Kremer. That might change in the aftermath of the tragedy in Zanesville, Ohio, last October, when a debt-ridden owner freed his exotic animals before he committed suicide. In the end, police shot and killed 49 animals, including lions, bears, and 18 Bengal tigers. Without legislation, Kremer says, anyone can buy a tiger, lion, even a giraffe from a breeder. Problems arise when owners realize too late that a lion is not man’s best friend. Kremer introduces me to Sassafras, a 14-year-old abandoned lion found roaming a farm in Illinois. The lion had somehow escaped from his cage and killed the husband and the family dog. When the wife came upon his body, she committed suicide. Sassafras now lives out his days in the shade of this forested land on the outskirts of Tampa. He’s one of the fortunate ones. 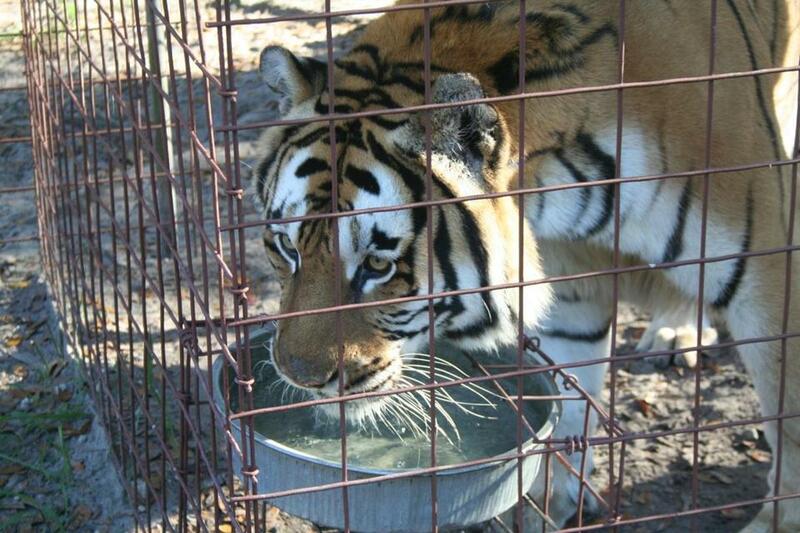 Many cats are turned away simply because Big Cat Rescue does not have the space or money to take in more animals. On average, the cats eat 400 to 500 pounds of meat a day, a costly venture financed primarily by donors. Big Cat Rescue does not breed and asks owners who want to donate a wildcat to sign a waiver stating that they will not purchase another exotic animal. Not all the wildcats here have been exploited. Kremer points to four African servals, medium-size cats that were kept in the basement of a house for four years and were well fed. The owners could not afford to feed them any longer. More than 100 volunteers here feed the animals, clean the enclosures, and check for any abnormalities. If something is wrong, they consult a veterinarian on staff. Baskin was on a tall ladder mending a fence when I visited in December. When not at the sanctuary, she is actively working with legislators to enact stricter laws on the exotic animal trade. Kremer tells me that some visitors don’t want to hear the sad stories and simply want to see the fascinating creatures. As long as he can delve into the need for wildlife conservation, he’s OK with that arrangement. “Regardless of what happened before these animals arrived, I want to make sure that their remaining days are as pleasurable as possible,” he says. Stephen Jermanok can be reached at www.activetravels.